Rising dramatically from the depths of the Caribbean Sea is the stunning volcanic island of Saba. The small Dutch Caribbean Island is often called the “unspoiled queen” due to its pristine natural beauty. Visitors will discover a place where high-adrenaline scuba diving adventures and challenging nature hikes are balanced with plenty of opportunity for peace and quiet in a tranquil tropical setting. In 1816, Saba became a possession of the Netherland Antilles. In 2010, Saba, along with St. Eustatius and Bonaire, joined the special municipality of the Kingdom of the Netherlands. The known history of the island began about 1175 B.C. with its first settlers, the Ciboney Indians, settling near present-day Fort Bay. The next arrivals were the Arawak Indians who migrated from South America around A.D. 800. In 1493, Columbus sailed past Saba but did not attempt to land due to the treacherous volcanic coastline. It was 1632 before the first Europeans made an unexpected landing when they were shipwrecked and forced to take refuge on the island. The first attempt to settle the island occurred in 1640 when the Dutch West Indies Company located on St. Eustatius brought people over to colonize the island. Unfortunately, the infamous British pirate, Henry Morgan, had different plans. Due to the constant conflict between Britain and the Netherlands, Morgan chased the Dutch settlers off the island. Skirmishes continued over the next 200 years as ownership of the island bounced among the Dutch, Spanish, French and English. During this time, Saba’s first village, The Bottom, was established. Saba became a haven for pirates for many years; when piracy was curtailed, people of Dutch, Irish, English, Scottish and African descent inhabiting the island eased into a calmer existence. As the men became sailors and fishermen, the women crafted delicate lace known as Spanish Work. Today, boutiques throughout the island sell this exquisite handmade lace, now called Saba lace, to its many visitors. Agriculture also grew as locals began to cultivate the rich, volcanic soil. The island continued to progress as churches opened their doors in 1829, creating schools to educate the children. With the eventual construction of Saba’s only road, airport and pier, the island was opened to tourism in the late 1980s. Saba is essentially the top of a volcano active in the late Pleistocene era, about 500,000 B.C., with the last eruption occurring 5,000 years ago. Mount Scenery, the highest point on the island and in the Dutch Kingdom, has an elevation of 2,877 feet (872 m). Misty clouds typically cover the summit, creating a cloud-forest environment. Also known as the Elfin Forest, it comprises the upper 150 feet (45 m) of the summit, one of five climate zones on the island. Dense vegetation and a variety of rare plant species thrive in the damp environment. Mountain mahogany trees play host to ferns, intricate mosses, lichens and colorful orchids. Below the summit is another distinctive zone filled with elephant ears, tree ferns and mountain ferns. A secondary rain forest morphs into a dry evergreen forest down from the summit. Sea grapes, cacti and redwood trees are a few of the species in this area. The fifth climate zone occurs closer to the sea. The terrain is rugged with sheer walls and steep cliffs scattered with occasional shrubs and grassy meadows. A few sandy bays on the island are constantly in flux due to the ever-changing ocean swells. Saba’s flora and fauna are an eclectic mixture of endemic and introduced species. Delicious fruits brought to Saba include bananas and mangoes while animals include goats, chickens and little tree frogs. Endemic species are the harmless red-bellied racer snake and the Saban anole. Saba is home to more than 60 species of birds, most of which are seabirds. Sooty and bridled terns as well as brown boobies and frigate birds soar along the coast. The uniquely beautiful red-billed tropicbirds with distinctive long white tails nest among the high cliffs. Other birds visiting Saba include the energetic bananaquits, red-tailed hawks and flashy hummingbirds. The friendly Sabans welcome visitors to their alluring island where most make their home in the settlements of Windwardside, Hell’s Gate (Zion’s Hill), St. John’s and The Bottom. Nestled within the lush green landscape, the towns are quite picturesque; homes are all painted white with green trim and red roofs. In the towns, restaurants, small bars, boutiques and shops are scattered along streets colorfully decorated with bougainvillea and hibiscus. 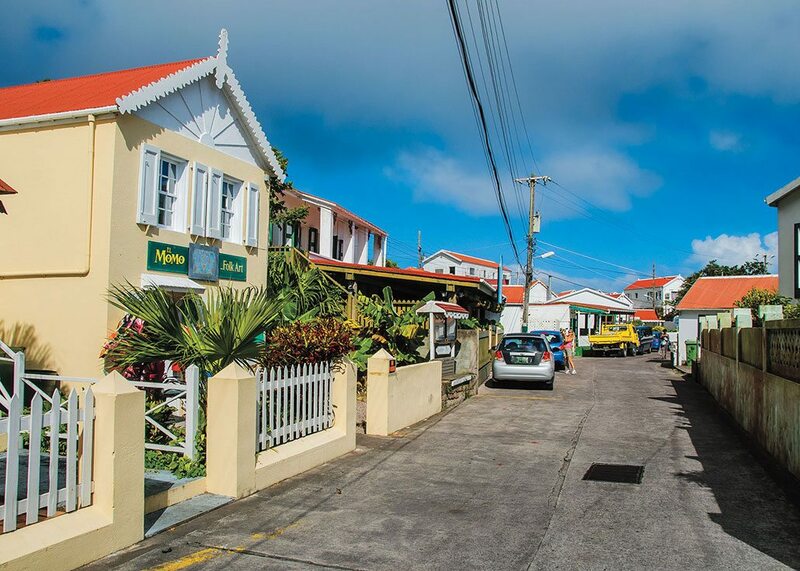 Accommodations to suit the needs of Saba’s 25,000 tourists include inns, cottages, rentals and small, inviting hotels. Exploring the villages on foot is a great way to step back in time and enjoy the old Caribbean still alive today. For many generations, islanders have recognized and appreciated their homeland’s unique beauty and have made every effort to preserve Saba’s natural treasures, from the top of Mount Scenery to the healthy reefs surrounding the island. In 1987, steps were taken to formalize preservation measures by establishing the Saba Conservation Foundation (SCF), a nonprofit, nongovernmental organization created to “preserve and manage Saba’s natural and cultural heritage” through education, research, monitoring and enforcement. The Saba National Marine Park (SNMP) is also managed by the SCF. The park covers 5 square miles (13 sq km) of the Caribbean waters encircling Saba from the high-water mark to 200 feet (61 m) deep. In 1987, the SNMP was established when the government passed the Marine Environment Ordinance to protect marine life and the pristine coral reefs. In 2010, the Saba Bank National Park was designated as part of the Netherlands National Park. Located 2.7 miles (4.3 km) southwest of Saba, Saba Bank is a large submerged atoll rich in biodiversity. The top of the seamount is an excellent fishing ground. Preservation efforts also began in 2012 to gain official status for two land-based nature reserves — the Saba National Land Park and the Elfin Forest Recreational Reserve. The SNMP has an important two-fold effect on Saba. It protects the environment and serves as a tourist attraction that finances the majority of Saba’s economy. One of Saba’s most exciting events concerning conservation is presented by the Sea & Learn Foundation, a nonprofit foundation established in 2003. The award-winning program is open to the public as well as local schoolchildren free of charge. Sea & Learn is held the entire month of October. More than a dozen world-renowned scientific experts are invited to participate in the environmental awareness event. Attendees learn through evening presentations at restaurants and hotels as well as hands-on field projects and interactive activities. During the early settlement of Saba, the only way to reach The Bottom was a difficult, steep climb up 800 steps carved from stone, starting at Ladder Bay. Everything imported to the island had to be carried up the steps and transported along narrow trails by foot or donkey to the final destination. Although a road was badly needed, many said it was an impossible endeavor due to the rugged terrain. However, a local man, Josephus “Lambee” Hassell, began educating himself through correspondence courses on civil engineering. In 1943, Hassell, with the help of the islanders, began the incredible job of building “the road that couldn’t be built.” The road from Fort Bay to Mount Scenery Trail was painstakingly chiseled out of the cliffs, mostly by hand and without the aid of heavy machinery. It took 15 years to complete the project. The road, an engineering marvel, provides gorgeous panoramic views of the Caribbean, neighboring islands, quaint villages and stunning seascapes. The prospect of an airport also seemed impossible. With the help of Captain Remy F. de Haenen, a pilot from St. Barts, and persistent locals, an airport was completed at Flat Point. The Juancho E. Yrausquin Airport, with one of the shortest commercial runways in the world, was inaugurated September 18, 1963, linking Saba to its international hub, St. Maarten, 26 miles (42 km) southwest of Saba. Today four 16-passenger flights land every day of the year, along with chartered flights. The last major step opening Saba to tourism was the construction of a pier at Fort Harbor, the commercial center of the island. The Captain Leo Chance Pier, completed in 1972, welcomes local fishermen, ferries, dive boats and shipping companies to its dock. Sabans are as proud of their underwater world as they are of their alluring, beautiful island. To ensure the continuation of the pristine reefs, in 1987 forward-thinking leaders designated the area around the island a marine park, placing 30 buoys on popular dive sites. The flourishing reefs are covered with a colorful cluster of corals, red encrusting sponges and huge colonies of yellow tube sponges. Turtles, parrotfish, Atlantic blue tang, barracudas, spiny lobsters, occasional sharks, stingrays and more live among the reefs. Amazing natural volcanic formations consist of large boulders, caves, tunnels and rock walls, all seemingly frozen in time. In many areas, the reef is very deep close to shore, virtually eliminating shore diving. As a result, most diving is done from fast, efficient boats or by live-aboard. Most sites are only a few minutes from the harbor. 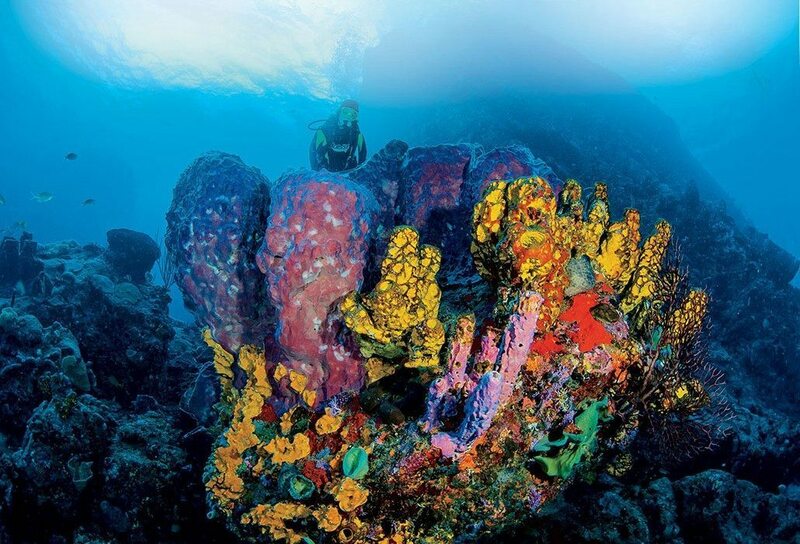 About 30 dive sites provide exhilarating adventures for divers and underwater photographers. Saba’s signature dives, the Pinnacles and Diamond Rock, are truly wonders of nature. Rising from the seafloor 330 feet (100 m) below to within 90 feet (27 m) of the surface, the Pinnacles is a volcanic structure encrusted with vibrantly colored corals beckoning divers to explore beyond their limits. Divers must watch their depth gauges, especially when diving with nitrox. Diamond Rock, a pinnacle jutting above the surface, is easy to see off the western side of the island. The rock appears to be covered by snow but is actually covered with bird guano. Diamond Rock is similar to Pinnacles except for the depth. Frequent visitors to both dive sites include turtles, sharks, jacks and barracudas. Because the sites are not as protected as sites closer to the island, prevailing winds and currents can make it impossible to dive at certain times. No doubt, you will want to dive these sites, as well as the other sites, more than once because there is so much to see and many photographs waiting to be taken. Besides lounging by the pool enjoying the warm sunshine, vacationers can browse through small shops in search of special souvenirs or learn a bit of history by visiting the Harry L. Johnson Museum in Windwardside. The museum, housed in a 19th-century sea captain’s cottage in the historical district, contains artifacts of the Amerindians as well as collections from the 19th and early 20th centuries. For a picturesque experience, take a short walk to the tidal pools at Flat Point. Small enclosures among rugged volcanic rocks are constantly filled by large waves crashing against the rocks, leaving behind tiny pools of clear water containing small flora and fauna, creating a photographer’s dreamscape. A short distance from the tidal pools is Saba’s only natural public swimming pool, a safe place for visitors to enjoy a refreshing swim. Typical white-sand beaches are not found on Saba. However, when conditions are right, the shore at Well’s Bay is transformed into a small beach of golden sand. For the adventurer, snorkeling is possible from the shore. There are two main attractions that draw visitors to Saba — hiking and scuba diving. Hiking is very popular with those who enjoy exploring nature in its purest form. The adventure begins with a visit to the Saba Trail Shop in Windwardside where guests register, receive maps and trail information, walking sticks, whistles and guided-tour details. Hikers are also requested to pay a small fee to help with park maintenance. More than a dozen trails snake across the island, all with a no-take, no-disturbance code of conduct. Four trails are within the Saba National Park (SNP) — the North Coast Trail, Sulphur Mine Trail, All Too Far Trail and the Sandy Cruz Trail, all of which wander beyond the park’s boundaries. Other trails such as Spring Bay Trail, Bottom Mount Trail and Ladder Trail are outside the SNP boundaries. Trails range in difficulty from moderate to strenuous; most are best enjoyed with the aid of a guide. Sabans gather each year to celebrate occasions such as Saba Day and Carnival. Saba Day is a national holiday held in early December to celebrate the islander’s heritage and national pride. Fun festivities revolve around barbecues, sporting events, band contests and award ceremonies honoring distinguished Sabans. Carnival is an exciting summer festival held the last week of July. Locals look forward to this island party featuring delicious food, great music and a grand parade filled with happy, brightly costumed villagers dancing in the streets. Clean, green and pristine best describes this little slice of paradise in the Caribbean Sea. Visitors will enjoy a truly relaxing vacation with as much adventure as they wish to experience. Whether hiking, diving or simply lounging, Saba truly is an unspoiled queen.